We are publishing here large extracts from a reader who, while welcoming the overall approach of the leaflet on the Yellow Vest movement distributed by our section in France, also criticises certain of our positions, in particular the idea that nothing good for the proletariat can come out of this inter-classist movement. These questions touch on extremely important aspects of the proletarian struggle: what is the working class, its struggle, its perspective. It’s only through a broad, open and animated debate that we can elaborate deeper responses, participate in the development of class consciousness, arm ourselves with the weapons of theory. We thus encourage all our readers to write to us, to formulate their criticisms, their agreements or their questions in order to fuel a debate that is vital for the proletariat. This is the spirit in which we are replying to this letter. We can recognise, as your leaflet does, that the spontaneous outbreak of these blockades expresses a very deep social anger. An anger that is very diverse, if not contradictory, expressing the inter-classist nature of the movement and its “citizen” or even nationalist expressions. I basically agree with your critique about this. The idea of a trap laid for the workers. What meaning should we give to this term “trap”? A trap presupposes an organisation that prepares and organises it. But we see nothing of that sort here. Here again, is it possible to conceive of an autonomous class struggle as a precondition for a significant movement? Doesn’t the class struggle become autonomous in the course of the movement itself? A trap for the workers? Our leaflet asserts that this movement is a real trap for the workers. But the comrade says: “What meaning should we give to this term ‘trap’? A trap presupposes an organisation that prepares and organises it. But we see nothing of that sort here”. It’s quite true that this movement was spontaneous. A young entrepreneur from Seine-et-Marne launched on social media a petition against the increase in petrol prices. Then a lorry driver, dressed up in a yellow vest, from the same department, called for roads to be blocked. Through a whole chain of clicks, these two cries of anger were propagated everywhere, testifying to a general feeling of being fed up throughout the population. So this was not a trap laid by the bourgeoisie, its state, its parties, its unions or its media; it was a movement which was a trap for the workers because of its inter-classist nature. Because in an inter-classist movement where the workers (employed, students, pensioners, unemployed) are diluted as individual citizens in a milieu made up of all the other layers of society (petty bourgeoisie, peasants, artisans), the social aspirations and methods of struggle of these intermediate layers were dominant. This why the point of departure for the movement was the explosion of anger among self-employed lorry drivers, taxi drivers and small bosses from the PME, in response to the tax increase on petrol that served to penalise their enterprises. This is why the main means of action was the occupation of roundabouts and crossings, then of the “the most beautiful avenue in the world”, the Champs-Élysées, a hi-viz yellow vest on their backs, in order to “be seen”, to “be heard” and above all “to be recognised”. This is why the Tricolore flag, La Marseillaise and the references to the French revolution of 1789 were omnipresent alongside the shouting about “the people of France”. These are methods which in no way express a mobilisation of the working class on its own terrain, putting into question capitalist exploitation through demands such as wage rises, opposition to lay-offs etc. Furthermore the methods of struggle of the working class were never expressed. The absence of strikes in the different sectors of the class or of general assemblies, in which the exploited can debate and draw out the aims of their struggle, clearly confirms this. Even worse, the rotten terrain of populism and xenophobia gangrened a large part of the movement. We saw some of the most nauseating expressions of the current historic period. Like the appeals to strengthen anti-immigrant laws and even xenophobic actions. Over 90% of the sympathisers of Marie le Pen’s Rassemblement National support the “Yellow Vests” and over 40% say that they are themselves taking part in the movement. This indeed is the snare that those workers who don the yellow vest are caught up in. This movement has been a real trap for them. What are the causes of the political difficulties of the working class? In a few lines this letter poses a central question: “There is also in the leaflet the idea that the working class is being prevented from struggling… Are the workers simply being “prevented” from openly struggling on their class terrain? Obviously not”. What are the causes of the current political difficulties of the working class? The answer can’t be found by taking a snapshot of the proletariat today – you have to examine the whole film of its history. So we can’t reply fully here to this complex question. We can simply insist on one point. We should not underestimate the permanent work of sabotage by the trade unions whose specific role for the past century has precisely been that of undermining the struggle in the workplace and the consciousness of the class. A single example: just a few months before the Yellow Vest movement the trade unions organised the “stop-start strike of the railway workers”; thousands of very militant workers engaged in numerous strike days, completely isolated, cut off from other sectors of the proletariat. And yet at the same time, in the old age homes, in the post office, in the day nurseries, the hospitals, in certain factories etc, struggles were breaking out on a regular basis, each sector in its own corner. Then the CGT issued the call for the “convergence of struggles”, a simulated unity consisting of marching in the street, one sector behind the next, each with its own slogan, its own corporate demand … and then going home without any common general assembly, without discussion, without solidarity in the struggle. These union movements, which are repeated year after year, have the sole function of spreading the poison of division, of despair, of powerlessness. So yes, the systematic sabotage of working class unity is one of the major ingredients in the current weakness of the proletariat, a weakness which creates favourable soil for the explosion of inter-classist anger which has no perspective. In fact, the bourgeoisie is exploiting the weakness of the working class to try to drive it further into the ground. The working class has indeed been going through a very difficult period. Since 1989, with the campaigns on the collapse of Stalinism, which was identified with the so-called “failure of communism”, the proletariat has not been able to rediscover its class identity, to recognise itself as a revolutionary class. Unable to put forward the perspective of a society without exploitation, the exploited class remains very vulnerable, but above all extremely passive when it comes to the struggle. While large sectors of the proletariat have not recognised themselves in the popular revolt of the Yellow Vests, neither have these central sectors been able to mobilise themselves in a massive and unified way against the attacks of the government, on their own class terrain and with their own methods of struggle. However, despite these difficulties, the proletariat has not been defeated. Taking into account the general level of discontent and the new attacks to come, the great mass of the proletariat can still throw off its lethargy in the period ahead. The future still belongs to the class struggle. The Yellow Vests, a springboard for the class struggle? Even if it started on a bad basis, could the Yellow Vest movement transform itself into something different, into an authentic movement of the working class? In favour of this thesis, you could point to the widening of the demands raised, since the rejection of the tax increase on petrol took a back seat to a broader protest against poverty and in favour of increased buying power. Furthermore, the sympathy for the movement in the population was certainly real. If the movement has never been massive (around 300,000 Yellow Vests at the high point) and while the majority of workers in the big plants and public sector remained spectators, it remains the case that it enjoyed a lot of popularity. Again in support of this thesis, there are historical precedents. Here are three, by no means the least of them: the Paris Commune of 1871 began as an explosion of anger that in appearance was nationalist and anti-Prussian; the mass strike in Russia in 1905 began under a religious banner, led by a priest, Father Gapon; May 1968 in France was initiated by a movement of students who, at the time, had often come out of the petty bourgeoisie. Each time, the working class was finally able to put itself at the head of the struggle, with its own methods, its forms of organisation, its strength. To paraphrase our reader, “the class struggle became autonomous by emerging as such during the movement itself”. So could the Yellow Vest movement transform itself into something else, into a real workers’ struggle? In fact, the comrade himself answers his own question in his letter: “This is indeed a mixed social movement, in which the balance of forces is not favourable to the working class and is giving a free hand to other strata out to defend their interests, which is hardly surprising today”. But why is this? Because we are not in 1871, 1905, or 1968. In 1871, the Paris Commune was not an exception. In many regions of Europe, but particularly in France, the working class was in struggle and several “Communes” appeared. The mass strike in Russia in 1905 was preceded by a deep process of rising proletarian struggle, of developing consciousness and organisation, again at the international level, since the 1890s (Rosa Luxemburg masterfully described this process in her book The Mass Strike, the Political Party and the Trade Unions). May 68 broke out after a year marked by very important workers’ struggles, particularly in the big factories in the west of France. Today, we are not seeing any of this. As we saw above, the working class is going through major difficulties. It is not even conscious of its existence as a social class antagonistic to the bourgeoisie and distinct from intermediate social layers like the petty bourgeoisie. It has lost the memory of its own past and is not able to refer to its immense historical experience; it’s even ashamed of it since the bourgeoisie is constantly assimilating the working class to an extinct species and uses the word “communism” to describe the barbarity of Stalinism. In this situation, the Yellow Vest movement can in no way function as a kind of springboard or spark for an authentic struggle of the working class. On the contrary, the proletarians who have come out behind the slogans and methods of the petty bourgeoisie, drowned in the interclassist ideology of “citizenship”, diluted among all the other social strata, can only suffer the pressure of bourgeois democratism and nationalism. In this sense its fortunate that the majority of the working class has contented itself with giving platonic support and that the mass of proletarians have not participated in a movement that has no perspective. This reticence reveals that, leaving aside the sympathy for some of the demands about poverty, the working class has from the start been very circumspect about the fixation on taxes and about the methods used (occupation of roundabouts) and concerned and even disgusted by the immediate support that has come from the right and extreme right. This distrust shows that, despite its difficulties in engaging in the struggle on its own terrain, the proletariat has not been crushed, defeated, or massively mobilised behind the putrid ideology of the petty bourgeoisie and behind populist, anti-immigrant xenophobia. In the last few weeks, amidst this whole swamp, there have been a few shafts of light: the high school students came out in struggle against the reform of the baccalauriat (without the Marseillaise and the Tricolore), not for themselves directly, but in solidarity with future pupils who will experience a much degraded education. At the same time, university students mobilised to oppose increasing fees for foreign students and raised the slogan “Solidarity with the immigrants”. 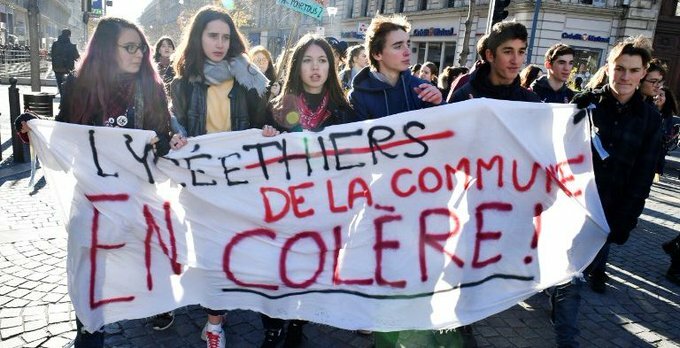 The anger of the young educated generation – who are mainly future workers – is a sharp response both to the iniquitous measures of the government and the anti-immigrant slogans raised by the Yellow Vests. Solidarity is key to the strength of the working class. The proletariat has momentarily lost its class identity. It has been cut off from its history and its experience. But it is still there, still alive. In its depths, reflection about the lack of perspective offered by capitalist society continues, especially among the most conscious and combative elements. Driven by the aggravation of the economic crisis, not yet conscious of its own strength, not yet confident in its capacity for self-organisation, the proletariat will be obliged to engage in the combat for the defence of its own living conditions. Faced with the momentary paralysis of the class struggle, revolutionaries have to be patient, not fear isolation, all kinds of criticisms and misunderstandings. They have to unmask all the enemies of the proletariat, all the ideological traps and dead-ends, in order to participate, to the maximum of their still limited forces, in the real development of consciousness within the working class, with the conviction that only the class struggle can provide a perspective for the future of humanity.